Previously, the Connex3 and Stratasys J735/J750 only utilized VRML files for full-color printing. While the VRML file is more than capable to handle the task, it was never fully adopted by the 3D printing industry. Enter the .OBJ file, a tried and true widely utilized full color 3D file format that basically packages a full-color texture map with an STL file. By utilizing the .OBJ file, users will be able to easily produce full-color parts directly out of many popular software packages and 3D scanning scanners like those from Artec. A new PolyJet feature introduced with GrabCAD 1.24 is support contact preview. This feature lets the user preview where the support will make contact with a part printed using PolyJet technology. This feature lets the user preview where the support will make contact on a part with a checkerboard pattern using PolyJet technology. Stratasys Fused Deposition Modeling (FDM)systems has also received some large and exciting updates: Variable Width Infill. This feature allows Stratasys FDM printers to extrude thinner and/or thicker widths of material in the interior of thin walled sections of models for better strength and density. Previously, as you design your part thinner and thinner (especially on tapered parts), there is a point where the area inside the part is too narrow for the 3D printer to extrude material using the default tool path width. This then required users to make edits to the tool path widths manually in the Insight software. With Variable Width Infill, the infill extrusions widths can fluctuate in width automatically, allowing the extrusion to get thinner in narrow portions of the part for a more solid print with fewer gaps and weak points. Currently, this new feature is only available on the Stratasys F123 series and the Stratasys F900. Work is being done to incorporate the Fortus 380/450 and legacy Fortus 900 machines in the coming months. This is a very exciting feature and one that will most likely require firmware upgrades for Fortus machines. We will keep you posted as we learn more about the release dates for these machines. 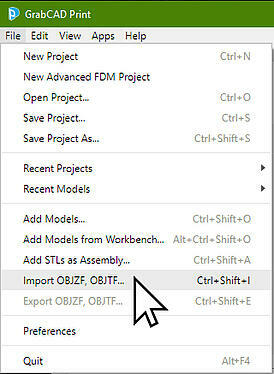 Yes, there is a new icon in the top left corner of your tool bar, and yes, it might change the way you design and print parts using FDM systems. 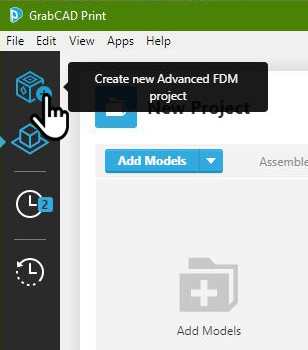 Advanced FDM is a tool that blurs the lines between GrabCAD, Insight and CAD. This new feature allows the Fortus 360, 380, 400, 450, 900, F900, and F370 machines to bring in native 3D CAD files and control the print settings of various features of the CAD model. This also allows the software to change dimensions on features like holes to leave extra material for drilling and tapping, along with presets for widely available threaded inserts. There is a lot to cover on this topic and trying to cover it in a text-only blog will not do it justice. We will produce a video that will review all the features that the Advanced FDM tool has to offer and link it here. In the meantime, here is a link to GrabCAD's instructions for the use of the Advanced FDM tool. Last but not least, we have a laundry list of smaller features. These include improved tool tips for easier navigation of the user interface along with information added to the printer queues highlighting what tips are used on a particular job and how much material is required to run it. Additional features also include new materials such as TPU92A for the F123 machines, Med ABS on the Connex3, and Vivid Cyan, Vivid VeroFlex colors, and Agilus30 White on the J735/J750 PolyJet machines.